Highlight of the event was the presentation to the Cambria Volunteer of the Year. The Cambria Cup was presented by Tony Farnham, Cambria’s Honorary Ambassador, to Deben Johnson. Deben is 17 and has volunteered with sb Cambria for two and a half years. 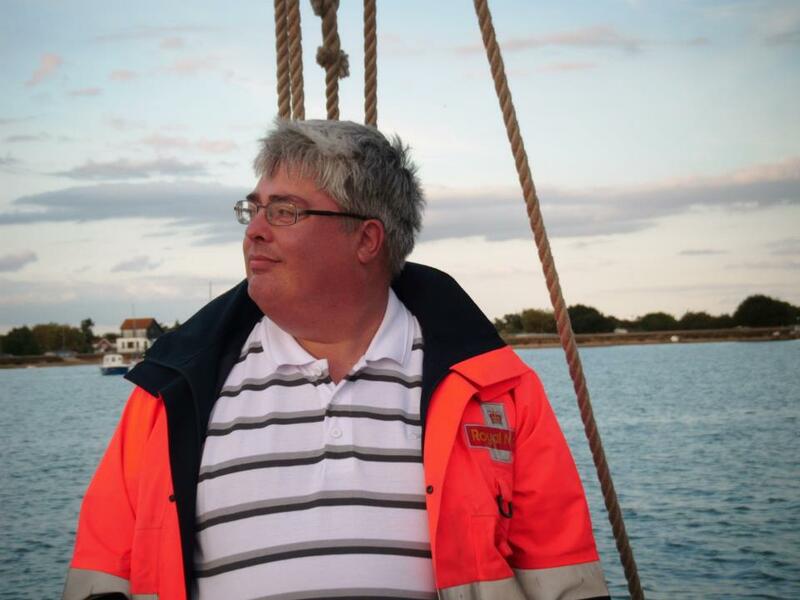 He has sailed as Third Hand on the barge, and has also put his skills to good use on board. 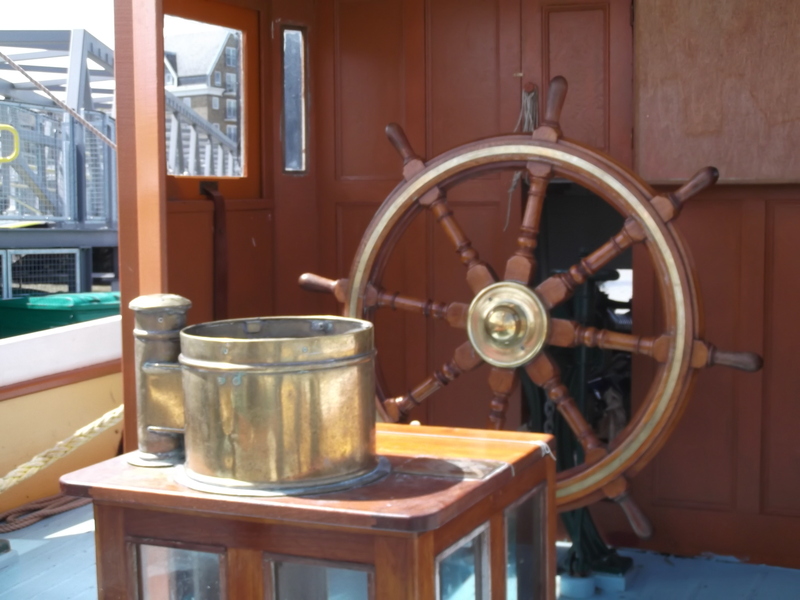 As a woodwork apprentice he has carried out considerable work on the barge boat as well as on the barge itself, including work on all the wooden blocks. The Cambria Cup was won by Cambria in 1930 and subsequently passed into Tony’s ownership. He donated it to the Cambria Trust to be used in this way. Sorry for the poor quality of the photo – I was not in a good position to take it, either that or the lens was very dirty! Here’s the Compass which was presented to sb Cambria in memory of Tony Ellis, and a close up of the brass plate commemorating the occasion. Tony Ellis was the inspiration behind the project to restore Cambria. It was he who eventually persuaded The Maritime Trust to sell the rapidly deteriorating vessel to The Cambria Trust for one pound. 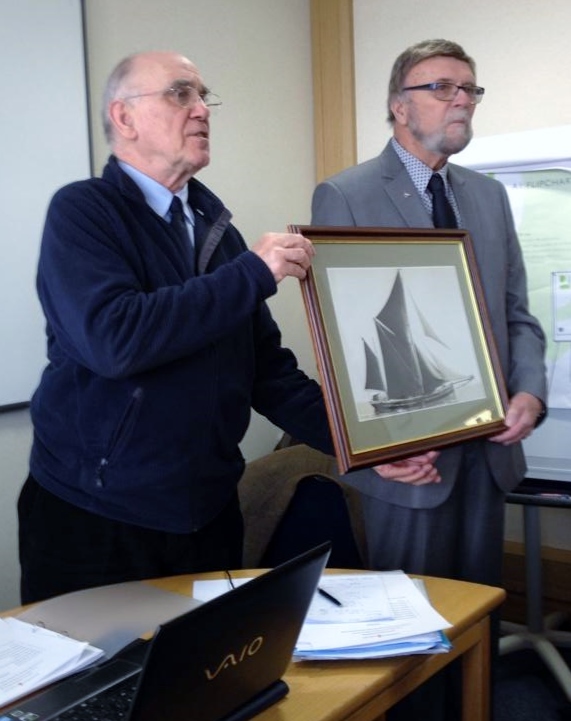 It took twenty years to complete the project and for Cambria to rejoin the fleet of Thames sailing barges. Sadly Tony Ellis died in 2008, three years before Cambria sailed again. 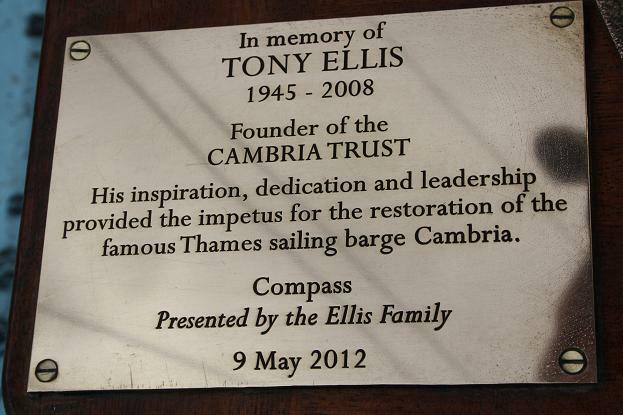 The Ellis family donated a sum to enable a large old compass to be bought and installed on the barge as a memorial to Tony and it was blessed at a short memorial service during the re-dedication of Cambria in May 2012. Many of the photos we feature on The Barge Blog and in our Gallery are taken by Dave Brooks, a Committee Member of SSBR, and of the Cambria Trust. Today we are posting this great photo of Dave on sb Kitty, taken by Annie Meadows who said: “Team Kitty are off out soon for a PLAY. No customers, just crew, lots of sails to set – Let’s go! !” Well it was Regatta day at Maldon. 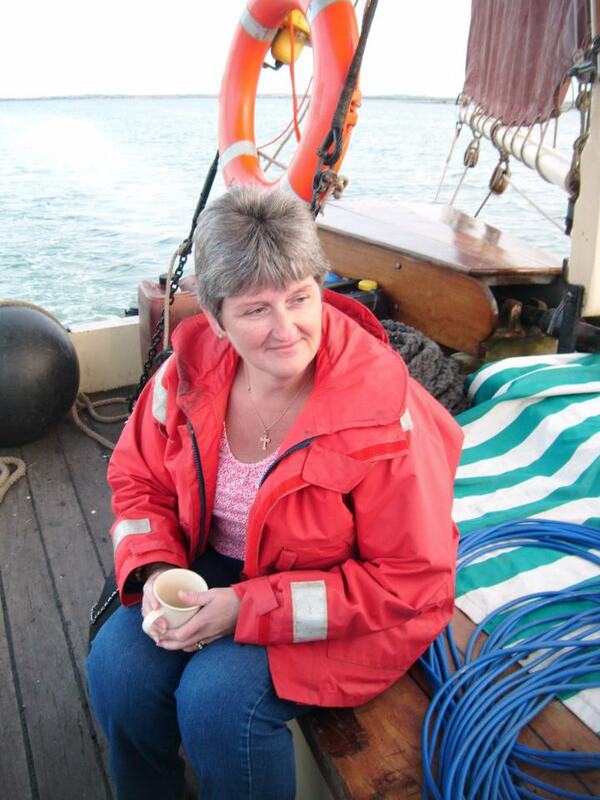 And because she deserves a picture too, here’s one of Dave’s wife, Julie, also enjoying the sail on Kitty.